organizational design – expert consulting for agri-coops to adopt and enforce innovative and market-driven governance structures. organizational diagnostics – bench-marking surveys and analyses of agri-coops on the basis of both financial and non-financial metrics. impact evaluation – experimental (RCTs) or quasi-experimental surveys and analyses to assess the impacts of interventions in support of agri-coops. executive training & coaching – advisory services and capacity building events to improve the leadership, management and governance of agri-coops. graduate education – tutoring, seminars, internships and vocational/professionalizing courses for University students. global networking – to promote and facilitate PPPs, exchange visits and programs, participation in international workshops, conferences and summits, and raise awareness about job, funding, collaborative and other opportunities for international cooperative development. 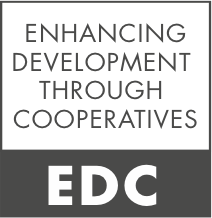 All EDC research and action stem from the "Cooperative Life Cycle Framework"
The EDC initiative is financed and led by OCDC, CIAT, OXFAM and CTA.